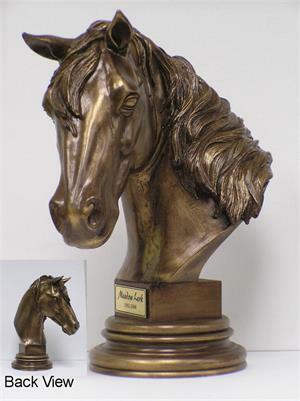 A beautiful way for the equestrian to memorialize the majestic beauty of their horse. Made of cold-cast bronze (a combination of resin and bronze powder) with a hand-polished bronze patina. This urn is lightweight and economical yet gives the appearance of a quality bronze piece. As it does not have the capacity to hold the full amount of a horse's ashes, it can be used as a freestanding keepsake or mounted upon a full size horse urn. Choose to order the bust itself or add the optional 2.5" x 1" personalized name tag at an additional charge. For a bolder statement, our oak horse urn is made to complimant this horse bust urn. Would you like to add a name plate to your urn?